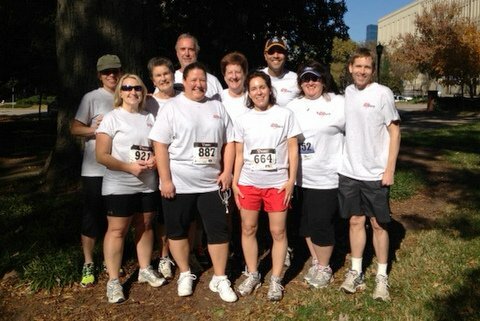 Congratulations to members of the ISCHEMIA trial team, who recently participated in the Fall Festival 5K in Raleigh. For many members of the group, it was their first time running in a race. During a team meeting in the spring, team member Anne Heath mentioned that she had just run her first mile in a long time. DCRI fellow Akshay Bagai, MD, suggested that everyone could get in shape together and train for a race. They formed a running group, ordered ISCHEMIA team t-shirts, and began training for the 5K race. The shirt featured the ISCHEMIA logo on the front. The back said DCRI ISCHEMIA team and the team motto, "We're raising our heart rates to protect yours!" For some members, the goal was to finish the race, or to run the race without stopping. On race day, Karen Alexander, MD, placed first in her age division and won a $25 gift certificate. Other team members not pictured are: John White, Sarah O’Brien, who ran with her children Avery and Jacob, and Dave Crowder, who ran with his children, Lane and Mattie. Unable to participate in the race due to illness or family issues include Anne Heath, Taylor Nguyen and husband, Joni O’Briant, Gena and Bill Rankin, and Sheri Ussery.